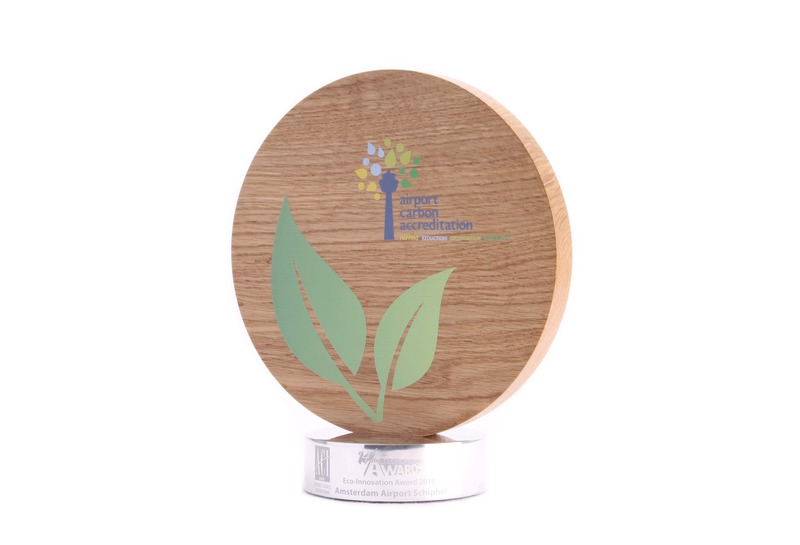 This is a sustainable award created by Gaudio for the ACI Airport Carbon Accreditation Award. With a sustainable award, you can expect the same undoubtedly high-quality design and manufacture, made with a range of sustainable materials. The top is light oak, and FSC-certified. We use UV-printing technology for colour-matched printing, which then dries instantly. We’ve used our printing facilities to emphasise the award title, as well as print the event branding. Crafted from high-quality aluminium alloy, the base has a polished finish, done at our in-house polishing facilities. Engraving the details onto the base makes each award a particularly special lifelong keepsake, perfect for display. Both the polished aluminium and the bespoke oak makes for a professional finish, and a striking sustainable award.